Cress (Lepidium sativum) are fast-growing, edible herbs believed to have originated from Iran. Cress is often called “garden cress” to distinguish it from other plants that share the same name. This annual, herbaceous vegetable has been part of the human diet for centuries thanks to its unique peppery taste and high nutritional value. India and Europe have long recognized cress for its potent medicinal properties, of which it has many. Cress stands as one of the best sources of vitamin C; just an ounce of cress is enough to deliver 32 percent of the recommended daily value of this important vitamin. Compared to oranges, cress offers more vitamin C, ounce by ounce. Just about all parts of cress can be consumed. Cress leaves are mainly eaten as part of salads and sandwiches. 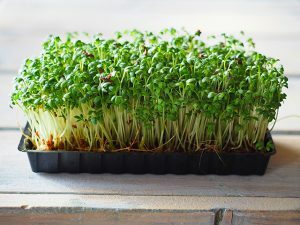 The baby green or sprout versions of cress are frequently eaten too. Dried or fresh cress seed pods can be used as seasoning, namely as substitutes for pepper. Cress as a whole does well in light and heavy meals. From salads to muffins to poultry dishes, cress can enhance their flavors and add a special touch to these dishes and many others. One notable use of cress hails from the United Kingdom. There, cress shoots are mixed with boiled eggs, mayonnaise and salt then eaten toast. The most abundant nutrient in cress is vitamin K, a mineral that plays important roles in cardiovascular health and bone health. Not only does vitamin K prevent blood from clotting, but it also facilitates the mineralization process and ensures that the bones remain strong and hard. A cup of cress can provide well over 200 percent of the recommended daily value of vitamin K, so even a small serving of this herb will be helpful. Cress contains a moderate amount of manganese, which adds to overall mineral density in bones. When coupled with vitamin K, these nutrients shape out cress as an ideal preventative food against osteoporosis and osteoarthritis. Additionally, a cup is packed with 69 percent of the recommended daily value of vitamin A, the vitamin that keeps the eyes healthy and diminishes the risks of cataracts and macular degeneration. Cress can encourage lactation, making it a great addition to the diets of breastfeeding mothers. Because cress contains goitrogens, it should be avoided by people with thyroid problems. Goitrogens are substances that can prevent the thyroid from absorbing iodine, leading to hypothyroidism.